This article is about the festival. For the sumo wrestler, see Daimonji Kenji. 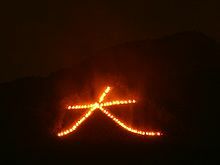 Gozan no Okuribi (五山送り火), more commonly known as Daimonji (大文字), is a festival in Kyoto, Japan. It is the culmination of the Obon festival on August 16, in which five giant bonfires are lit on mountains surrounding the city. It signifies the moment when the spirits of deceased family members, who are said to visit this world during O-Bon, are believed to be returning to the spirit world—thus the name Okuribi (送り火, roughly, "send-off fire"). The origins of the festival are obscure, but it is believed to be ancient. Specific families have the hereditary duty of organizing all the logistics of the bonfires, and they spend many hours annually providing volunteer labor to maintain this tradition. Daimonji (大文字), the character meaning "large" or "great:"
Hidari Daimonji (左大文字), again, the character meaning "large:"
The most famous—and the first to be lit—is the character dai (大), on Kyoto's Daimonji-yama (大文字山, daimonjiyama). The other four fires are lit at five to ten-minute intervals, and by 8:30, all the characters can be seen. Each bonfire lasts for 30 minutes. Wikimedia Commons has media related to Gozan no okuribi. ^ "Gozan-no-Okuribi (Part 1)". Retrieved 2018-08-31. ^ "Kyoto Recommends" (PDF). Kyoto City Tourism Association. Retrieved 2018-08-31.